We’d like to thank Kellyrose for sharing this story. 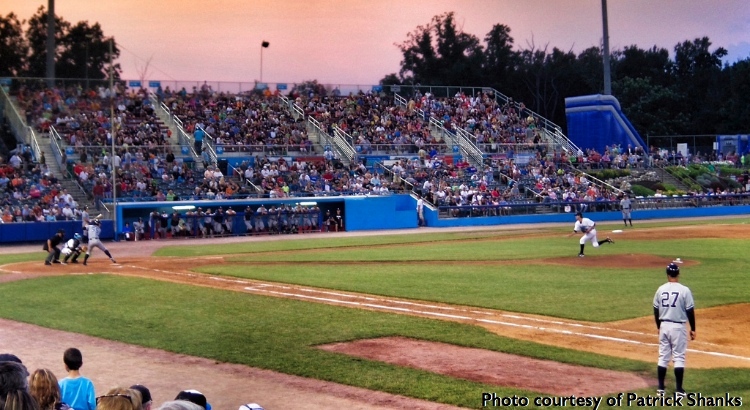 The summer I was 11 years old, I looked about 8 and was habitually forced to attend Hudson Valley Renegades baseball games with my family every Friday night. Unbeknownst to my 11-year-old-Ghost-buster-loving-self, Bill Murray was part owner of this minor league baseball team. One August Friday they were giving out Bill Murray bobbleheads as a gag and, much to everyone’s surprise, he actually showed up. Bill ended up sitting right behind me and I wanted to say hi so bad, but the people in my section were warned not to make a big deal out of it and let him pay attention to the game. I decided that the best loophole was to get him to pay attention to ME, so I furrowed my brow and looked directly at him, apathetically wiggling my bobblehead. Within two minutes he caught sight of this, locked eyes with me, and started wiggling his own head in tandem with the bobble head. After what felt like a good while, my father looks at me, then double takes because Billy and I are intently bobbling at each other. He loudly announces that I have to “stop bothering Mr. Murray”, to which “Mr. Murray” replied “Oh she’s alright” and gave me what I can only describe as a noogie. That was the best baseball game of MY LIFE. I literally can’t think of a single life goal or accomplishment of mine that trumps “getting a noogie” from Bill Murray.